CAP/Capulet (Capt), Slingshot (Ssh) and Cofilin/Twinstar (Tsr) are actin-binding proteins that restrict actin polymerization. Previously, it was shown that low resolution analyses of loss-of-function mutations in capt, ssh and tsr all show ectopic F-actin accumulation in various Drosophila tissues. In contrast, RNAi depletion of capt, tsr and ssh in Drosophila S2 cells all affect actin-based lamella formation differently. Whether loss of these three related genes might cause the same effect in the same tissue remains unclear. Loss-of-function mutant clones were generated using the MARCM or EGUF system whereas overexpression clones were generated using the Flip-out system. Immunostaining were then performed in eye imaginal discs with clones. FRAP was performed in cultured eye discs. Here, we compared their loss-of-function phenotype at single-cell resolution, using a sheet of epithelial cells in the Drosophila eye imaginal disc as a model system. Surprisingly, we found that capt and ssh, but not tsr, mutant cells within and posterior to the morphogenetic furrow (MF) shared similar phenotypes. The capt/ssh mutant cells possessed: (1) hexagonal cell packing with discontinuous adherens junctions; and (2) largely complementary accumulation of excessive phosphorylated myosin light chain (p-MLC) and F-actin rings at the apical cortex. We further showed that the capt/ssh mutant phenotypes depended on the inactivation of protein kinase A (PKA) and activation of Rho. Although Capt, Ssh and Tsr were reported to negatively regulate actin polymerization, we found that Capt and Ssh, but not Tsr, share overlapping functions during eye morphogenesis. Remodeling of the actin cytoskeleton is controlled by various groups of actin-binding proteins that function at different steps to promote dynamic F-actin assembly and disassembly. Cyclase-associated protein (CAP) homologs have been suggested to act as actin monomer sequestering proteins through their C-terminal actin-binding domains to suppress the spontaneous polymerization of actin [1, 2]. Cofilin, an actin depolymerization factor, severs and depolymerizes older F-actin from the pointed end of the filament . Cofilin is inactivated by phosphorylation of an N-terminal serine by LIM kinase  and activated by removal of the phosphate by Ssh, a cofilin phosphatase . capt and tsr encode the Drosophila CAP and cofilin orthologues, Capulet (Capt) and Twinstar (Tsr), respectively. Loss-of-function mutations in capt, ssh and tsr all cause increased ectopic accumulation of F-actin in various Drosophila tissues that leads to defects in epithelial morphogenesis [5–9]. For example, it has been shown  that Capt, by affecting actin polymerization, alters cell shape and therefore affects the distribution of Hh. However, RNAi depletion of capt, tsr, and ssh in Drosophila S2 cells affects actin-based lamella formation differently . Drosophila retinal differentiation starts in third instar larvae when a moving MF sweeps across the developing eye disc in a posterior-to-anterior direction. Cells anterior to the MF proliferate and have a large apical surface whereas cells within the MF undergo apical constriction. Moreover, cells posterior to the MF differentiate and form ommatidial clusters that secrete Hh proteins [11, 12], whereas the remaining interommatidial cells (ICs) relax and regain a large apical surface. The anteriorly-diffused Hh activates the expression of target genes such as dpp and atonal in a strip of cells immediately ahead of the MF . The transient activation of the Hh pathway in these cells converts Ci from a repressor (Ci75) to an activator (Ci155). Hh-mediated apical constriction in the MF requires RhoA/Rho kinase and other unidentified kinases that act through both myosin II and Diaphanous to respectively cause the enrichment of activated myosin II and F-actin in the apical cortex of these cells [9, 14]. Rho kinase activates myosin II via phosphorylation of Ser19 of the MLC. In this report, we compared the loss-of-function phenotypes of capt, tsr, and ssh using the sheet of epithelial cells in the Drosophila eye imaginal disc as a model system. We demonstrated that capt and ssh, but not tsr, mutants within and posterior to the MF similarly showed: (1) largely complementary accumulation of excessive F-actin and p-MLC, and (2) hexagonal cell packing with discontinuous AJs in the eye epithelial cells. We also found that these phenotypes depended on the inactivation of PKA and activation of Rho. Thus, Capt and Ssh have common functions in regulating actin depolymerization during eye morphogenesis. The following stocks were used: capt E636 , ssh 1-63 , tsr N96A , UAS-R*, twf 110 , UAS-Rho N19 , ubi-DE-cad-GFP. Loss-of-function mosaic clones were generated using the MARCM system . Entirely capt E636 or ssh 1-63 mutant eyes were generated using the EGUF (eyeless-Gal4 UAS-FLP) system of recombination . Flip-out clones were generated by P[act5C > y+ > GAL4] P[UAS-GFP.S65T]/CyO. For immunostaining, third instar larval eye imaginal discs were dissected and fixed in 4% paraformaldehyde. Antibodies used were: rat anti-DE-cad (DCAD2; 1:50; Hybridoma Bank), mouse anti-Arm (N2-7A1; 1:40; Hybridoma Bank), rabbit anti-pSer19-MLC (1:10; Cell Signaling Technology), rat anti-Ci155 (2A1; 1:1; Hybridoma Bank), rabbit anti-Egfr (1:50; ), Alexa 594-phalloidin (1:200; Invitrogen), and Cy3- and Cy5-conjugated secondary IgGs (Jackson Immuno Research Laboratories). Images were acquired using a 63× NA1.4 Oil Plan-Apochromat objective lens on a confocal microscope (LSM510, Carl Zeiss). The fluorescence intensity and apical surface area were quantified using Zeiss LSM software. The percentage of cells with x-sided polygons was quantified manually by measuring the number of neighboring cells. For fluorescence recovery after photobleaching (FRAP), third instar larval eye discs with ubi-DE-cad-GFP were dissected and placed in a drop of serum-free M3 medium at room temperature. A small area (1500 nm2) was photobleached. Fluorescence intensity in the bleached region or tricellular junction was measured at each time point using Zeiss LSM software. 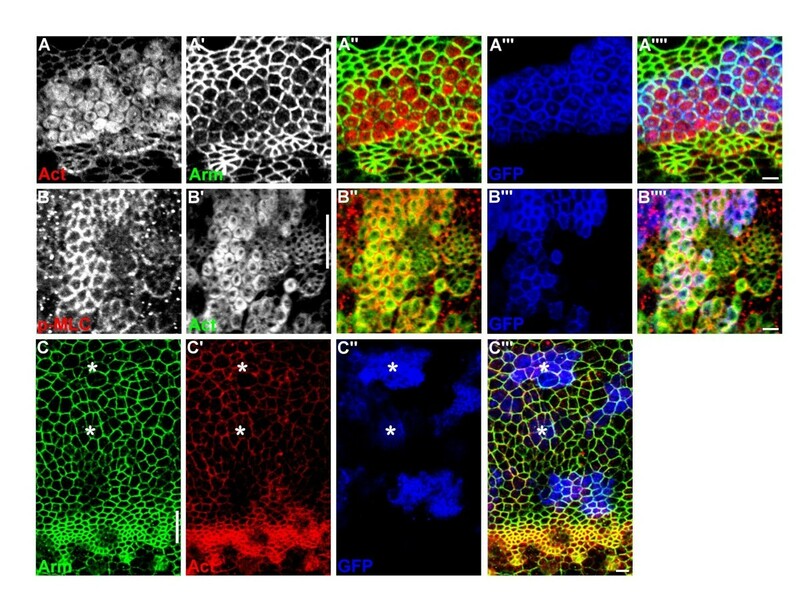 It was previously shown that loss of capt, ssh and tsr in the Drosophila eye epithelia, at low resolution, all caused similar accumulation of F-actin and enlarged apical area [5, 7, 9]. To determine whether the accumulation of excess F-actin caused by loss of capt, tsr and ssh might differentially affect epithelial morphogenesis, we compared the phenotypes of the loss-of-function null alleles (capt E636 , tsr N96A and ssh 1-63 ) at high magnification using the MARCM system (marked by the presence of CD8-GFP expression) in third instar eye imaginal discs  or by generating eye discs entirely mutant for capt/ssh. Cells in the MF have a small apical surface area (Figure 1A). Consistent with the purse-string model for apical constriction, MF cells also accumulated activated myosin II (revealed by p-MLC antibody staining, Figure 1A′) and F-actin (revealed by phalloidin staining, Figure 1B) that colocalize with circumferential AJs (revealed by Armadillo (Arm) antibody staining, Figure 1A). Behind the MF, the photoreceptor clusters that formed remained apically constricted whereas the ICs, with low levels of Arm, p-MLC and F-actin, relaxed and adopted irregular cell shapes (Figure 1A, B). As previously reported , capt E636 mutant ICs often had enlarged surface areas (Additional file 1: Figure S1). However, we additionally found that these cells, possibly due to minimization of surface free energy, often adopted a hexagonal cell shape (62 ± 2%, n = 450 cells in entirely capt E636 mutant eye disc vs. 24 ± 2%, n = 420 cells in wild-type eye discs, Additional file 1: Figure S2) and possessed discontinuous AJs with a higher density of DE-cadherin (DE-cad) (Figure 1C). These fragmented AJs were mainly localized to the center of each side of the hexagon, with AJs missing at the tricellular junctions (Figure 1C). Occasionally, more than one smaller fragmented AJ could be seen on the side of a hexagon (inset in Figure 1E′). Similar phenotypes were also detected with other AJ markers such as Echinoid and α-catenin (data not shown), indicating defects in the establishment/maintenance of circumferential AJs. Importantly, the discontinuous AJs were detected not only along the interface between capt E636 and capt E636 mutant cells but also between wild-type and capt E636 mutant cells (orange arrowheads in inset of Figure 1C). Thus, the discontinuous AJs formed on one side of a capt E636 -wild-type interface, possibly via homophilic interaction of DE-cad, affected the distribution of AJs on the adjacent wild-type cells. Moreover, the discontinuous AJs could also be non-autonomously detected along the interface between wild-type cells when they were surrounded by the capt E636 mutant cells (red arrowheads in inset of Figure 1C, see Discussion). capt mutant phenotype behind the MF. (A,B) Confocal images of wild-type third instar larval eye imaginal discs stained for Arm (green in A), p-MLC (red in A) and actin (red in B). Lines indicate the position of the MF, and anterior is to the top. Bars, 2 μm. (C) capt E636 mutant MARCM clones (GFP, blue) posterior to the MF labeled for DE-cad (green). Inset: High magnification image of three wild-type ICs (indicated by dots, without GFP) shows fragmented AJs (orange arrowheads) at the interface between wild-type (dots) and capt mutant ICs (no dots) as well as fragmented AJs (red arrowheads) at the interface between wild-type ICs (dots). (D) Sagittal section of capt E636 mutant MARCM clones (GFP, blue) stained for actin (green) and Dlg (red). The MF and the area posterior to the MF are indicated as an arrow and an arrowhead, respectively. (E) Entirely capt E636 mutant eyes (posterior to the MF) stained for actin (red) and Arm (green). Upper inset: capt E636 mutant cells under high magnification (indicated by white dashed box in E′) shows AJs formed at regions with proximate F-actin rings (arrowheads). Lower inset: capt E636 mutant cells under high magnification (indicated by orange dashed box in E′) shows AJs failed to form at the tricellular junction where F-actin was absent (arrowhead). Anterior is to the top. Bars, 2 μm. (F) capt E636 mutant MARCM clones posterior to the MF (arrowhead) labeled for p-MLC (red) and actin (green). Dashed lines indicate clone borders. Lines indicate the position of the MF, and anterior is to the top. Bars, 2 μm. (G-J) Fragmented AJs were relatively stable and did not diffuse laterally towards the tricellular junction. (G,I) Images of ubi-DE-cad-GFP in cultured entirely capt E636 mutant eye discs. Boxes in G indicate an area (1500 nm2) of the fragmented AJs before and after bleach, and circles in I indicate an area (350 nm2) of a tricellular junction at zero and 3 min time points. (H) Averaged FRAP recovery curves for fragmented AJs (blue) and wild-type AJs (green). (J) Fluorescence intensity curves for the tricellular junction. Each data point represents the fluorescence intensity measured at each time point divided by the initial fluorescence of the adjacent fragmented AJs. Bars, 2 μm. Next, we determined whether loss of Capt in the ICs behind the MF affected the distribution of the actomyosin network. Unlike wild-type ICs where both p-MLC and F-actin were barely detectable, we observed strong apical accumulation of F-actin into a ring-like structure in sub-cortical regions of the capt E636 mutant ICs (Figure 1D, E). Of note, the fragmented AJs formed in regions where F-actin rings from two adjacent capt E636 mutant ICs came close together (arrowheads in upper inset of Figure 1E′) whereas AJs failed to form at the tricellular junctions where F-actin was absent (arrowhead in lower inset of Figure 1 E′). Surprisingly, we also observed dramatic accumulation of p-MLC at the apical cortex of capt E636 mutant ICs (arrowhead in Figure 1F), with the levels of p-MLC accumulation much higher than wild-type ICs (315 ± 12%, n = 21 cells). Importantly, this strong p-MLC staining outlined the cell morphology and partially overlapped with the F-actin ring (Figure 1F). Thus, fragmented AJs assemble at regions where cadherin/catenin, F-actin and myosin II overlap but do not assemble at the tricellular junction where F-actin is missing. Next, we determined the dynamics of DE-Cad within the fragmented AJs by analyzing the distribution of ubi-DE-cad-GFP in cultured entirely capt E636 mutant eye discs. As expected, DE-Cad-GFP localized to the middle of each side of the hexagon but was missing at the tricellular junction (Figure 1G). In tests of fluorescence recovery after photobleaching (FRAP) in an area (1500-nm2) of the fragmented AJs in capt E636 mutant cells, we found no significant recovery of fluorescence signal for over 55 s (Figure 1H). This is in contrast to the control, which showed faster recovery of DE-Cad-GFP fluorescence when we performed FRAP in the wild-type AJs (1500-nm2) of ubi-DE-cad-GFP discs (Figure 1H). Moreover, the fluorescence intensity in the tricellular junction of capt E636 mutant cells was very low, and we found that the fluorescence signal in a small area (350-nm2) of a tricellular junction did not significantly change for up to 3 minutes (Figure 1I, J). Together, our results suggest that the fragmented AJ was relatively stable and did not diffuse laterally towards the tricellular junction. The capt E636 mutant phenotype in ICs described above could also be detected in capt E636 mutant cells within the MF (Figure 2A,B), but, interestingly, not ahead of the MF (Figure 2C, and other data not shown). Due to the smaller apical surface of MF cells, the features of hexagonal cell shape and discontinuous AJs were less evident in capt E636 mutant MF cells (Figure 2A′). 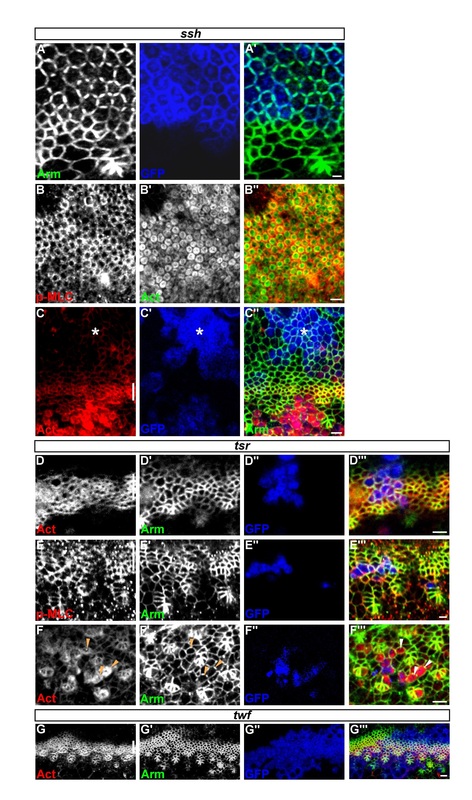 However, the capt E636 mutant MF cells had significantly enlarged apical area compared to endogenous MF cells (Figure 2A,B, Additional file 1: Figure S1) [7, 9]. Unlike the endogenous MF cells where p-MLC and F-actin strongly colocalize with circumferential AJs, we again observed partial overlap between the sub-cortically localized F-actin ring and AJs (Figure 2A) as well as between the sub-cortically localized F-actin ring and cortical p-MLC (Figure 2B) in capt E636 mutant MF cells. Of note, the levels of p-MLC accumulated in the capt E636 mutant MF cells were much higher than in the endogenous MF cells (216 ± 11%, n = 34 cells, Figure 2B). Mature AJs contain continuous E-cadherin that links to a circumferential belt of actin filaments that associate with the bipolar myosin II minifilaments to form the contractile actomyosin network . We speculate that the formation of discontinuous DE-Cad/AJ might prevent these capt mutant MF cells from full constriction that in turn caused the cell enlargement and the distortion of the MF (see Discussion). Together, our results demonstrate that capt plays an important role in cells within and posterior to the MF, and loss of Capt not only affects F-actin polymerization, as reported, but also MLC phosphorylation/activation, the continuity of AJs, and changes cell shape. capt mutant phenotype was detected within the MF, but not anterior to the MF. (A,B) capt E636 mutant MARCM clones (GFP, blue) within the MF show partial overlap between the sub-cortically localized F-actin ring (red in A) and AJs (Arm, green in A) as well as between the sub-cortically localized F-actin ring (green in B) and cortical p-MLC (red in B). (C) capt E636 mutant MARCM clones (GFP, blue) anterior to the MF (asterisks) labeled for Arm (green) and F-actin (red). In all images, lines indicate the position of the MF, and anterior is to the top. Bars, 2 μm. ssh encodes Slingshot, a cofilin phosphatase, and ssh mutant clones in the eye showed a strong accumulation of F-actin and an enlarged apical surface [5, 9]. Interestingly, we found that ssh 1-63 mutant clones within and posterior to the MF exhibited similar phenotypes to capt E636 mutant clones. These included (1) adoption of a hexagonal cell shape and discontinuous AJs (Figure 3A) and (2) strong accumulation of p-MLC at the apical cortex which partially overlapped the ectopic F-actin ring in the sub-cortical region (Figure 3B). Moreover, similar to capt, these phenotypes could not be detected in ssh 1-63 mutant clones located anterior to the MF (Figure 3C). ssh , but not tsr , share a similar phenotype to capt. (A-C) ssh 1-63 mutant phenotype. (A) ssh 1-63 mutant MARCM clones (GFP, blue) labeled for Arm (green). (B) Large ssh 1-63 mutant MARCM clones labeled for p-MLC (red) and actin (green). (C) Strong accumulation of F-actin (red) was detected only in ssh 1-63 mutant MARCM clones (GFP, blue) posterior but not anterior (asterisk) to the MF. (D-F) tsr N96A mutant phenotype. (D,E) tsr N96A mutant MARCM clones (GFP, blue) within the MF labeled for F-actin (red in D), p-MLC (red in E) and Arm (green). (F) tsr N96A mutant MARCM clones (GFP, blue) posterior to the MF labeled for F-actin (red) and Arm (green). Arrowheads indicate tsr N96A mutant ICs with elevated F-actin. (G) No excessive F-actin (red) accumulation, hexagonal cell shape or discontinuous AJs (Arm, green) were detected in twf 110 mutant MARCM clones (GFP, blue) within and posterior to the MF. In all images, lines indicate the position of the MF, and anterior is to the top. Bars, 2 μm. Ssh positively regulates cofilin/Tsr activity to promote F-actin severing and depolymerization . We thus looked next at clones mutant for Tsr, using the tsr N96A mutation. Compared to the endogenous MF cells, tsr N96A mutant cells in the MF showed enlarged apical surface as reported . However, unlike cap E636 and ssh 1-63 MF cells, tsr N96A MF cells contained largely normal levels and distribution of F-actin and p-MLC that overlapped with AJs (Figure 3D,E). Moreover, these cells did not adopt a hexagonal cell shape (Figure 3D,E). tsr N96A mutant cells posterior to the MF did show strong accumulation of cortical F-actin (Figure 3F) and, possibly via apical constriction, often led to groove formation when the clones were large (data not shown). 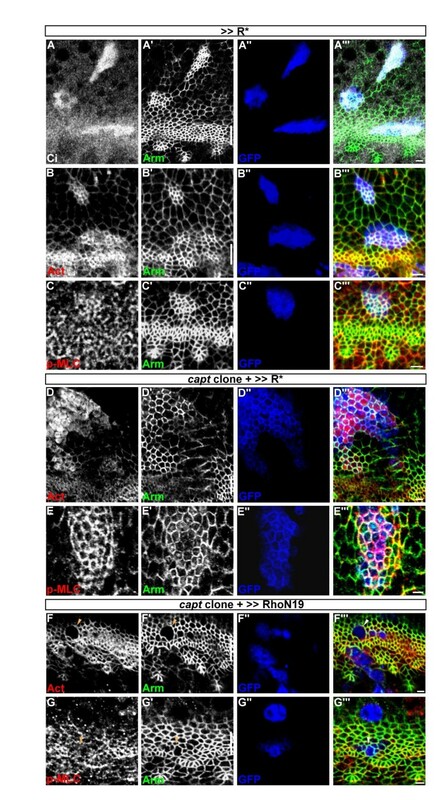 Thus, although capt, ssh and tsr all affected the apical surface, capt and ssh differed from tsr in their effects on F-actin polymerization, MLC phosphorylation and cell-shape change within the MF. Twinfilin (Twf), similar to ADF/cofilin, sequesters actin monomers and negatively regulates F-actin formation . However, we did not detect excessive F-actin accumulation, hexagonal cell shape, or discontinuous AJs when twf 110 null allele mutant clones were generated using MARCM within and posterior to the MF (Figure 3G and data not shown). Together, our results suggest that the effects in eye epithelial cells are capt/ssh-specific. Hh signaling is required to promote apical constriction downstream of Ci in the MF [9, 14]. We showed that the effects of capt/ssh in F-actin/p-MLC accumulation were only confined to cells within and posterior to the MF (Figures 2C3C). As these cells all received Hh signal beforehand, we next determined whether the described capt phenotype is dependent on Hh-mediated apical constriction. Protein kinase A (PKA) phosphorylates Ci155 to promote its proteolysis into the Ci75 repressor in cells anterior to the MF and this proteolysis is blocked by the activation of Hh signaling within the MF. We first generated ectopic clones, anterior to the MF, overexpressing the regulatory subunit of PKA (R*) to sequester the catalytic subunit (Figure 4A) and, therefore, to activate Hh signalling by upregulating the levels of Ci155 . As expected, we observed ectopic apical constriction in cells anterior to the MF, with enrichment of F-actin and p-MLC to a level similar to cells within the MF (Figure 4B, C). We then generated capt E636 mutant clones anterior to the MF using MARCM overexpressing R*. Interestingly, similar to capt E636 mutant clones within and posterior to the MF, much stronger F-actin (Figure 4D) and p-MLC (Figure 4E) accumulation as well as discontinuous AJs (Figure 4D′, E′) were detected in capt E636 mutant clones anterior to the MF. These data indicate that the capt mutant phenotype anterior to the MF is dependent on the inactivation of PKA activity or the resultant accumulation of Ci155/removal of Ci75. capt mutant phenotype depends on Hh pathway. (A-C) Flip-out clones overexpressing UAS-R* (GFP, blue) anterior to the MF labeled for Arm (green), Ci155 (white in A), F-actin (red in B) and p-MLC (red in C). (D,E) capt E636 mutant MARCM clones overexpressing UAS-R* (GFP, blue) anterior to the MF labeled for actin (red in D), p-MLC (red in E) and Arm (green). (F,G) capt E636 mutant MARCM clones (GFP, blue) overexpressing UAS-Rho N19 labeled for actin (red in F), p-MLC (red in G) and Arm (green). Arrowheads indicate capt E636 mutant cells. In all images, lines indicate the position of the MF, and anterior is to the top. Bars, 2 μm. It was shown that Hh signaling acts through Ci to regulate Rho/Rok/myosin II to cause apical constriction . We next determined whether the accumulation of p-MLC and F-actin in capt mutant cells is dependent on the activation of the downstream effector Rho. To test this, we overexpressed a dominant negative form of Rho (RhoN19) in capt E636 mutant clones using MARCM. These clones tended to be small, however, we found that inhibition of Rho activity abolished capt-mediated accumulation of F-actin and p-MLC within and posterior to the MF (Figure 4F,G), indicating that the accumulation of p-MLC and F-actin in capt mutant cells required the activation of Rho. Together, our results suggest that the capt mutant phenotypes detected were dependent on the inactivation of PKA and activation of Rho. Cofilin is activated by Ssh, the phenotypic differences between capt/ssh and tsr mutant MF cells are unexpected. However, as mentioned in the Introduction, RNAi depletion of tsr and ssh in Drosophila S2 cells affects actin-based lamella formation differently . Recent studies also show that loss of capt, but not tsr, leads to activation and nuclear import of Yorkie in the wing disc [27, 28]. Thus, the effect generated by the lack of cofilin (as in tsr mutant cells) is not completely the same as disrupting cofilin and p-cofilin recycling (as in ssh mutant cells). The reason for this is unclear. One possibility is that cofilin activity is regulated by multiple additional mechanisms, including dephosphorylation of phosphorylated cofilin by chronophin and general phosphatase . Alternatively, Capt and Ssh have a common function independent of cofilin. Spot AJs in early embryonic epithelia contain homophilic DE-cad clusters in a stable microdomain and are bona fide sites of adhesion . Small but stable actin patches were suggested to underlie the stability of spot AJs . We found that, in actin-turnover defective capt/ssh mutant cells, fragmented AJs were stable and they assembled at regions where cadherin and high levels of F-actin overlapped. Thus, fragmented AJs and spot AJs might have a similar function but they differ in underlying F-actin organization. We showed that the fragmented AJs can also non-autonomously assemble along the interface between wild-type cells when they were surrounded by the capt E636 mutant cells. One possibility is that when there is a fragmented AJ formed at one side of a wild-type cell (along the interface between wild-type and capt E636 mutant cells), this fragmented AJ cannot link to the adjacent AJ (along the interface between wild-type cells) at the tricellular junction, and therefore this adjacent AJ also becomes fragmented once the associated actomyosin contracts. It has been proposed that capt is required to prevent premature photoreceptor differentiation ahead of the MF . Here, we showed that the capt/ssh mutant phenotypes, including the apical surface area, cannot be detected anterior to the MF. By using the enrichment of EGF receptor to mark MF cells , we observed roughly 8–10 rows of enlarged capt mutant cells with enrichment of EGF receptor in a capt mutant clone spanning the MF (Additional file 1: Figure S3A). This is similar to the presence of about 10 rows of endogenous MF cells in the wild-type disc . Thus, the numbers of MF cells are largely the same in both wild-type and capt mutant discs. However, as the capt mutant MF cells have enlarged apical area, they might occupy positions anterior to the endogenous MF and thus cause the distortion of the MF toward the anterior of the MF (Additional file 1: Figure S3A). However, this distortion of the MF, at lower resolution, was previously interpreted as premature photoreceptor differentiation caused by anteriorly diffused Hh . It was previously shown at low resolution that capt, ssh and tsr mutant cells all similarly cause accumulation of F-actin and enlarged apical area in the eye epithelia ,. Here, we found that capt and ssh, but not tsr, mutant cells share various phenotypes that are dependent on the inactivation of PKA and activation of Rho. In addition to the accumulation of F-actin as previously reported, these phenotypes also exhibited excessive accumulation of p-MLC, fragmented AJs and hexagonal cell shape. We are grateful to J. Treisman, T. Uemura, L. Luo, C.-T. Chien, the Developmental Studies Hybridoma Bank and Bloomington Stock Center for providing reagents and stocks. This research was supported by grants from the National Science Council, Taiwan to J.-C. Hsu. CML designed and performed experiments. JCH designed experiments and wrote the manuscript. PYL and YCL helped the genetic crosses and analyzed the data. All authors read and approved the final manuscript.